But we decided to pay homage today. At first, we tormented ourselves with how we would prepare the crab. When we were close to not agreeing, we almost decided to punt the crab for another day. But then I decided not only to pay homage to the crab, but to honor its purity. No muckety-muck. Purity! With tweaks. What we did, then, was to take the fresh picked lump meat and warm it in a little saucepot of butter and garlic (the garlic had been merely swiped over the sides and bottom of the pot). Lots of butter. I added more. 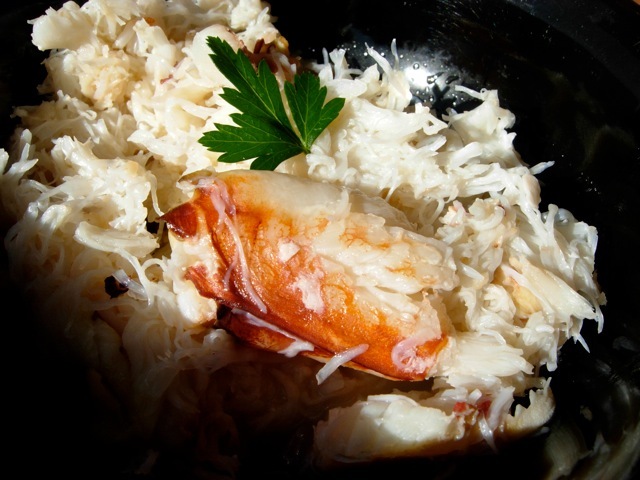 Put your warm, buttery crab meat into bowls and shower ever so lightly with truffle salt. That parsley leaf? Way too strong for this delicate delicacy. Way too strong. Eat with buttered bread and collapse into a crustacean coma. Somebody (not saying) is horizontal on the couch right now. We've been watching the crabbers on the nightly news, just waiting for opening day. Then we got busy and forgot. Maybe this weekend. Zoomie: They'll be around for a while, don't worry. This was mainly a ritualistic thing. And, we knew the crab was pretty fresh! That looks amazing. I'll have to get some for Zio! I am salivating. I plan to just warm the crab up and dip in melted butter. But probably not until tomorrow night. Zia: I'm scared you'll try it and find it wimpy. We debated minced fresh-picked cayenne from the garden. Would have loved it. Zhuzh it up if you're inclined. I was SO lucky to have large fresh crabs donated to my family by a sports fisherman last week! (They are allowed an earlier start to the season.) Because arrival times for guests were iffy, we ate it cold. Some of the people dipped it in a mayonnaise type sauce. I used only lemon. Lemon. Bread and butter. Fabulous white wine. The Bay is wonderful. Kudzu: Lucky indeed! Really cool. Thanks for affirming my "little-intervention" method of eating it. And bread. Must have bread. Oh, and I do like cold crab with mayo. How kind of nature to bless us with these things as the days grow dark. Wow!That photo is almost a religious experience. Crab on. Greg: I took exactly two pictures of this dish. This was the second one. Gold! Turn off the camera. Sally BK: Whenever anybody asks me if I'm working out, I say, "Well, I'm carbo loading." Good luck in your half marathon! Impressive. Drool... I came back today, thinking I would have something better to say. Nope. There it be. Do you think these things scuttle down to SoCal? yumyumyuyumyummmmy...I am going to serve crab for Thanksgiving and will do pretty much as you have - keep it simple because the taste of fresh crab is too delicate to muck with. and did I mention Yummy? Lauren: I do think you can get Dungeness in Southern California. It might be frozen, but c'est la vie. Check with Whole Foods. I really have no idea, but I bought Dungeness in Florida once, and you're a lot closer to the source. Good luck. homage,honor,purity and oh brother. They are bottom feeders that are darn tasty. Chilebrown: I know. A little uppity. But I do honor the Dungeness, and the Dungeness honors the Bay Area. I try to avoid using superlatives when discussing food but this is truly - my very favorite food to eat Cookie. I think you chose the best way to prepare it and let it shine. Shine: Thanks for the ultimate compliment. We are ready to have another go-round with the crab. Dog: You should have no trouble getting this!